Pope Francis Gets It. Do You? Pope Francis greets the public. First, I believe that we all can learn something — sometimes, many things — from anyone. 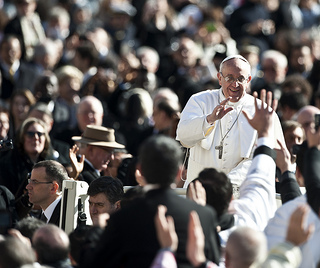 Second, Pope Francis clearly understands branding, managing one’s image, living one’s mission, communicating effectively, engaging others, and maintaining a good sense of humor. While the new Pope can certainly teach any number of lessons about religion and morality, I want to focus on what nonprofit managers and development professionals can learn from the new Pontiff. Know Your Brand. Pope Francis understands his brand. He is a Jesuit priest. The Order’s founding document, written by Ignatius of Loyola, calls on all Jesuits to take a vow of perpetual chastity, poverty and obedience. Through his lifestyle, public remarks, and image, the Pope has demonstrated his commitment to the principles outlined by the founder of the Society of Jesus (the religious order known as Jesuits). Effective nonprofit managers and development professionals know they must carefully craft and manage their institutional and personal brands. We must have a mission, understand the mission and be able to convey that understanding to others. Live Your Brand. Long before being elected the leader of the world’s 1.2 billion Catholics, Pope Francis lived his brand. For example, as a Cardinal in Argentina, he lived in a modest apartment rather than the more elegant, suburban Bishop’s residence. He used public transportation to get around. He cooked his own meals. In other words, he did not simply create a superficial public image. He created and lived a lifestyle. He lived authentically. Later, Pope Francis returned to his hotel to checkout of his room. He chose to take the bus rather than the Papal car. He was the new Pope, but he was also still the priest who rides the bus. Nonprofit managers and development professionals must be authentic. We need to be true to brand identity and mission. It is not enough simply to pretend to be a certain way. Authenticity earns the public trust that generates and maintains support. For example, there are charities that efficiently use donated funds to achieve their missions. However, there are also nonprofits or non-governmental organizations that squander contributed resources while still others are simply scams. On the surface, all may appear worthy of support. In reality, the authentic charities that operate with integrity are best positioned for long-term success on all fronts. Manage Your Image. When addressing the public, Pope Francis reportedly ignored prepared remarks written by his would-be handlers. Instead, he spoke for himself, off the cuff. For example, he spoke of his desire for “a church that is poor and for the poor.” Beyond choosing his own words, the new Pope also chose to wear a plain white cassock instead of formal Papal robes. When first introduced to the public, he wore a simple wooden cross rather than a gold one such as those worn by his predecessors.